The Cimitero Acattolico (or ‘Non-Catholic Cemetery‘) in Rome is John Keats’ final resting place. He is buried in the old part of the cemetery, near the Pyramid of Gaius Cestius. 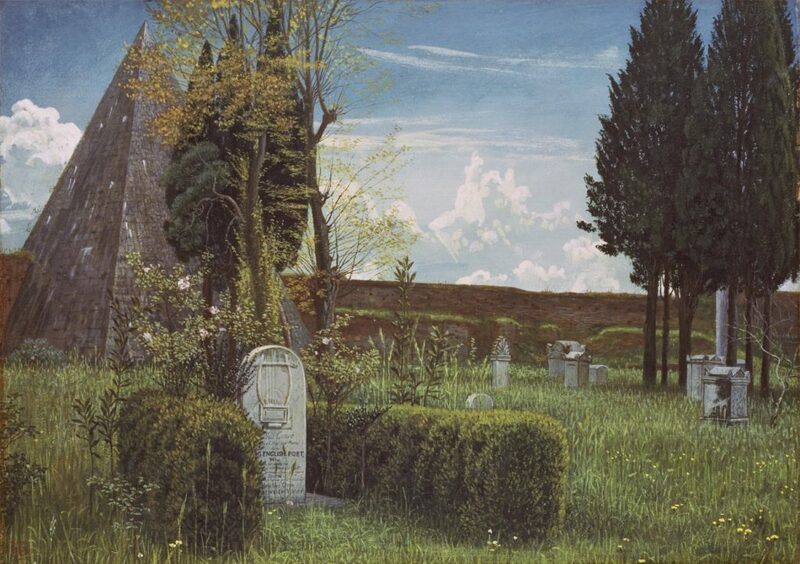 ‘The Grave of Keats’ (1873) by Walter Crane, held by the Ashmolean Museum, University of Oxford (source: Wikimedia Commons). John Keats died in Rome on Friday 23 February 1821, and was buried early on the following Monday. The Catholic Church’s ecclesiastical laws meant that only Catholic believers could be buried in Catholic churches or in consecrated ground. Burial places for non-Catholics were therefore required, especially for harbour cities such as Livorno and Venice, where a variety of people visited and mingled. These burial places have been known as ‘Protestant Cemeteries’, but of course they do not cater only for Protestant believers, and therefore the term ‘Non-Catholic’ is more appropriate and a proper translation – even if it doesn’t roll quite so smoothly off the tongue. The Pyramid of Cestius was built in 18-12 BC as a tomb for Roman magistrate Gaius Cestius. It is quite stunning to see, standing 37 metres high, with a very sharp slope, and clad in white marble. The Pyramid would have originally stood in open countryside, but as Rome grew the city began to encroach on the Pyramid. When the city’s Aurelian Walls were built in 271-275 AD, the Pyramid was incorporated in the walls – which has helped ensure its preservation. The contrast between the Pyramid’s white marble (when it’s clean!) and the red stone of the walls, has a remarkable effect. There are records of burials in the Non-Catholic Cemetery in Rome dating back to 1716, when members of the Stuart court (exiled from England) were buried in front of the Pyramid. 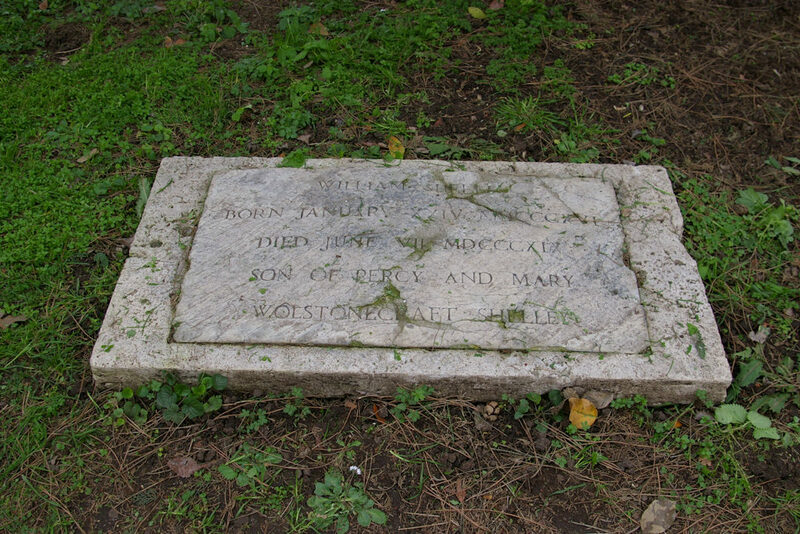 The earliest grave which has actually been found in the cemetery, though, is of George Langton, a graduate of Oxford, who was buried in 1738. Percy Bysshe and Mary Shelley’s beloved son William died at three years of age in Rome, in 1819, and was buried near the Pyramid. There is a grave marker, though apparently it is not quite in the right location. The grave marker for little William Shelley, his parents’ beloved ‘Willmouse’. Over 60 people in all were buried in the old part of the cemetery. Keats was one of the last to be buried there in that period, as it was decided the Pyramid should not be crowded out. 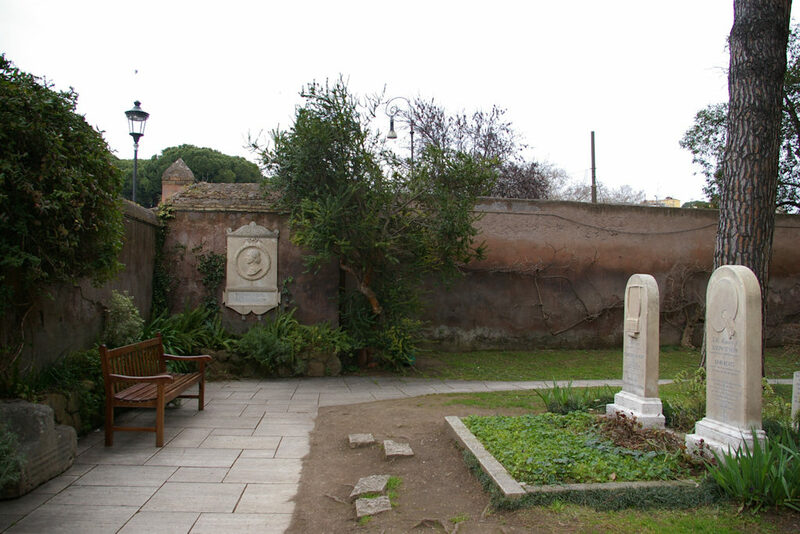 A new cemetery was established beside the old one, with the Aurelian Wall providing one long boundary for the whole. Percy Bysshe Shelley died in 1822, drowned off the coast of Tuscany, and (most of!) his cremated remains were buried in the new part of the cemetery, up against the Aurelian Wall. His friend Edward John Trelawny was buried beside him when he died in 1881. Joseph Severn, who loyally nursed John Keats through his last months, died in 1879, and at his request was buried in the old part of the cemetery next to Keats. Just behind them is the grave of Joseph’s son Arthur Severn, who died at eight months old in 1837. By its very nature, the cemetery contains a wide range of people – in terms of nationalities, languages and occupations – including Goethe’s son August, and Tolstoy’s daughter Tatiana, not to mention a grandson of Johann Sebastian Bach. (And the number of times the words ‘friend of Henry James’ appear in the list of burials makes me suspect him of being rather careless.) Whether you recognise other names, such as Antonio Gramsci or Constance Fenimore Woolson, will depend on your particular areas of interest. Oscar Wilde, visiting in 1877, declared it ‘the holiest place in Rome’. 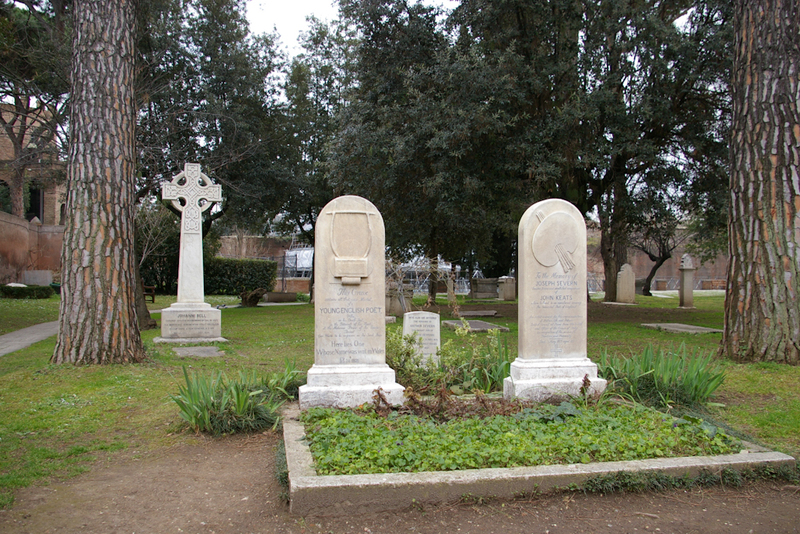 The Cemetery is managed by an association formed of the 15 foreign embassies in Rome which have nationals buried there. This includes Australia, Canada, Denmark, Finland, Germany, Greece, Ireland, Netherlands, Norway, Russian Federation, South Africa, Sweden, Switzerland, United Kingdom, and the United States of America. This private cemetery receives no government funding, and is therefore dependent on direct income and maintenance fees, fundraising and donations. The Keats-Shelley Memorial House in Rome maintains Keats’ and Shelley’s graves, but if you can help the Cemetery take care of the rest of their responsibilities, that would be marvellous! In 2006, the World Monuments Fund included the Cemetery on its Watch List of the most endangered sites on earth. The establishment of the Friends of the Non-Catholic Cemetery in Rome has helped address the issues. The Non-Catholic Cemetery is an astonishing place to visit. The pleasant pastoral feel of the old cemetery, and the dramatic yet not imposing Pyramid, are unforgettable. The new cemetery is a huge contrast, with almost every inch containing a grave, many with monuments, and barely enough room left for pathways. It is a beautiful place, though, and somehow full of light rather than gloom. And some of the statues – such as the ‘Angel of Grief’ draped over the tomb of the sculptor William Wetmore Story and his wife Emelyn – are amazing. A bench is placed before Keats’ and Severn’s graves, where you can sit and contemplate them quite peacefully. The cats of the cemetery may come and join you for a while. I cannot imagine a lovelier place for Keats to rest. John Keats’ and Joseph Severn’s graves, with a plaque in memory of Keats on the far wall. If you cannot make visiting hours, an ‘arrow slit’ in the outer wall allows you to peer in and pay your respects to Keats, who lies only a few feet distant. On a practical note, there are conveniences available, and a Visitors Centre. There are no refreshments available, but there are shops and cafes nearby, especially near the Piramide Metro station. 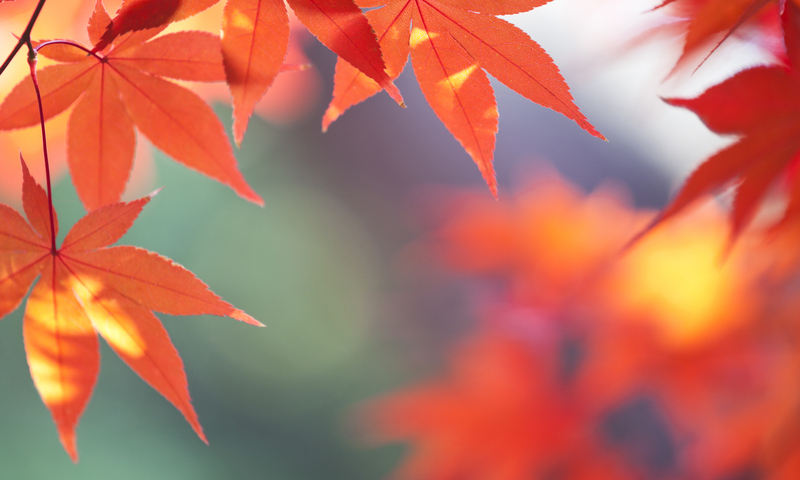 Opening hours: Open every day, but for only a half day on Sundays and public holidays. Check the details on the official site before you make firm plans! There is no entry fee, but donations are requested. A map of the Cemetery, with the graves marked. Keats is #1!